Eco-activists often insist that vegetarianism is the only truly earth-friendly diet for humans. On the other hand, there are many people, honestly trying to live as green as possible, who are not yet ready to take that step completely. Others of us find that we are just not healthy without some animal protein in our diet, and that there is some logic to the argument than humans are biologically omnivorous. If you are a meat-eater, whatever your personal reasons may be, the problem still remains — the beef industry is a nightmare. From enormous factory farms raising animals in horrific conditions, to growth hormones interfering with our bodies, to mad cow disease resulting from herbivores being fed ground-up brains of their kin, to the ecological devastation… We simply cannot allow ourselves to support this industry by buying its products. So what is the conscientious carnivore to do? The answer is three-fold. Buy small, buy local, buy grass-fed. The worst offenses of the beef industry are exclusive to the large, corporate factory farms. For instance, overcrowding leads to higher incidence of illness, leading to indiscriminate antibiotic use. Small family farms have much smaller herds, and so have less illness to begin with. They are more likely to care for their animals individually. And they are less likely to resort to toxic feed mixes, often growing their own feed for their herd. Buying local is always a good idea. In many cases, buying local non-organic vegetables is a greener option (in terms of carbon footprint) than buying organic vegetables which have traveled hundreds (or thousands) of miles. At your local Farmer’s Market, you can talk directly with the folks who grew and raised the food you’re going to put on your family’s dinner plates, whether flora or fauna. The “conventional” diet for farmed cows is primarily grain, soy and corn, with added animal by-products in many cases. Grain, soy and corn are cheaper (usually heavily subsidized) and fattens animals quickly, getting them to market sooner — thus maximizing the producer’s bottom line. Growing all that grain and corn forces out other crops. However, the natural bovine diet in fact consists of grass forage. By allowing their animals to follow their natural biological diet, grazing freely on existing pasture rather than grain (or worse) in feedlots, farmers find their grass-fed cows are healthier and less stressed. The grazed pasture is automatically manured, and thus regrows as the herd moves on to the next section. So, their feed is naturally self-renewing and sustainable, and does not destroy the land. Apparently, this method can even offset climate change. Called “sequestration,” the grass absorbs carbon from the atmosphere, subsequently returning it to the topsoil when it is trampled by the herds. Grass-fed beef farmers are generally very committed to ecological and ethical practices, and do not use pesticides, herbicides, antibiotics, or growth hormones. Of course, as with everything, buyer beware. “Grass-fed” is not a regulated term and you may find producers using it for meat that has not been ethically or organically produced. Get to know your supplier. Meat from grass-fed cows is higher in Omega-3s and conjugated linoleic acid (which may fight cancer), but much lower in overall fat. It is also higher in beta carotene, vitamin A and vitamin E. And many aficionados agree, it just plain tastes better. Grass-fed beef can be harder to find and you won’t generally find it on supermarket shelves. If you don’t have any luck at your Farmer’s Market, do try online. I order from a farm located about 2 hours out of town, and fill my freezer with quality frozen beef about every six months. Of course, the argument can still be made that any animal production is wasteful and detrimental to the environment. But it is highly unlikely that the entire western world will completely adopt vegetarianism anytime soon, so we must support and encourage sustainable alternatives that are at least more earth-friendly. If your family is not ready to completely eliminate meat from your dinner, this is by far a better option. As far as cost, how do the three compare? Buying conventional meat, buying organic meat (grass fed cows or organic chicken) and buying easy meat replacements (such as Quorn or Morningside)? I prefer the taste of Quorn and Morningside but they seem to be the most expensive option. Also, about grass-fed: we can assume that grass-fed cows spent some or all of their lives in a pasture. The local guy who sells grass-fed? Love the beef, of course (sorry, vegetarians). But he’s also a nice guy. He knows his cows and he’s incredibly helpful. Luckily, where I live, there are many many options for locally raised natural beef. A word about Omega: GF beef has them, whereas farm-raised salmon does not. It’s a food chain thing. Excellent article. Buying local does so much for health and the local economy. I personally enjoy knowing where my food came from and having a personal relationship with the producer. This is great information – I don’t even eat meat and I am a big fan of local, grass fed beef. Michael Pollan’s book, The Omnivore’s Dilemma explains this all so well. And shows you how a self sustaining farm is so much better for the environment/animals, etc. And also, how evil, evil, evil feed lots are. 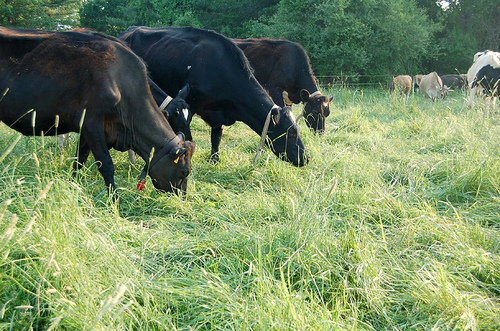 We are the largest certified organic 100% grass-fed cattle ranch in the USA, 600,000 acres, 90 square miles. Our beef is tender and more flavorful than any other grass-fed beef product, mainly caused by our ranches physical location. In the middle of the Rocky Mountains of Wyoming, the Cowboy State. Our grasses are dry and loaded with protein. Wyoming is where the Texans brought their cattle to get fat, high altitude and latitude creates forage that will finish livestock, it take more time, but we like it that way, and so do the cattle. When you serve our beef, you are eating the cleanest, healthiest, most sustainable, and most humanly raised, meat product on the plant. And its right here in the USA. We do not want customers; we want people that desire a relationship with where their food comes from, and who care about how it’s produced. Check-out our website and if you need more information please call, we love to talk about what we do, you see, here in the Rocky Mountains human contact is not something that we get everyday. As you can see from the photo: ranch1.jpg, we don’t have allot of neighbors. Great article. It has sparke3d a lot of discussion at Super Eco this month. Bo the First Dog, Bo the Water Dog, Bo the Green Dog? Formaldehyde in Cosmetics: What’s your teen wearing? ZapRoot: BPA Declared Baby Safe, Thanks FDA!